New Zealand is a beautiful country and we have a wide variety of trees. 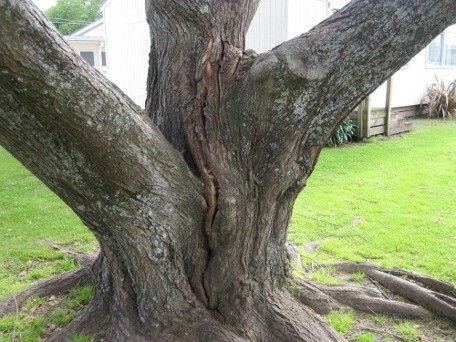 In spite of this, there are a number of myths surrounding trees and tree care in New Zealand. Arborists (tree care specialists) often encounter these myths, sometimes on a daily basis. Many people believe that when first planted, every tree should be staked. The truth is that unstaked trees build a better root system and are stronger as they grow to maturity. Only the larger trees need to be staked when they are planted. But, you are far better off to plant very small trees that don’t need staking. They may look like a tiny stick at the time, but you will be much better off in the long run. In fact after a few years, often the smaller, unstaked trees grow to a larger size than trees that were larger when they were planted. Not only is painting pruning cuts not necessary, it will have a negative effect on your tree. Painting pruning cuts will make the cut much more likely to get infected, and make it much harder for the tree to close over the cut. Correct pruning cuts made in the right place leave the trees natural defences in place, and the tree will be able to fight off fungi and bacteria much more effectively. Take note that it is of paramount importance that the pruning cuts are made correctly. Incorrect pruning cuts will have the same negative effects that are caused by painting the pruning cuts. It is not uncommon for people to plant evergreen trees because they have had enough of cleaning up after their deciduous trees in Autumn. The truth of the matter is that rather than drop all of their leaves at once, all evergreen trees drop leaves all the time! An evergreen tree is continuously dropping leaves and growing new ones. Although the leaf fall each week is at a much lower rate than a deciduous tree in autumn, it happens continuously all year round! The lesson here is that if you have trees, they will drop leaves. So find a tree that you like and plant it! If you need help with your trees, give us a call. We are trained professionals. A fully qualified arborist studies for three years to gain a Diploma in Arboriculture. At Groundzone tree care we are fully qualified arborists. We will know all of the trees in your property and the different care requirements of each of them.